One of my favorite kitchens other than my own is in the home of Jim and Jennifer Ford. Jim is practically a Zen Master when it comes to flavors, layers and textures in food. I suspect that much of that comes in part from the year-long, around the world trip he and his family took a number of years ago. They hit four of the five continents in eight months and during that time experienced a range of food that the rest of us can only dream about. Anyway, Jim is a fabulous cook. I truly enjoy what he does in the kitchen. And when it comes to sauces, he can really bring it. 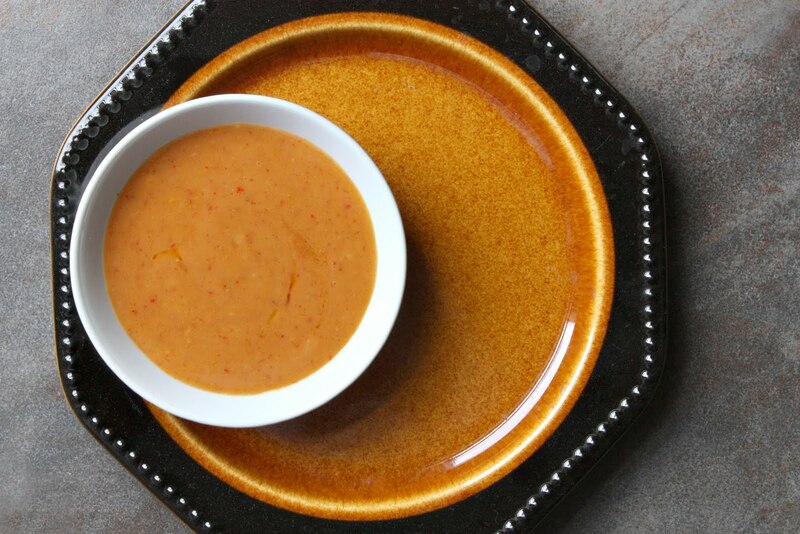 The recipe for this Thai Peanut Sauce comes from Jim’s copy of The Barbecue bible by Steven Raichlen. The recipe is on page 472… in Jim’s book, the page is stained with fish oil, lime juice, coconut milk and at least three other ingredients from this fabulous recipe. So give this a whirl and see if you don’t agree that you could almost just sit down with a bowl of this and one spoon, enjoy! Combine the ginger, chile, garlic, scallions, peanut butter, 1/3 cup coconut milk, 2 Tablespoons fish sauce, 1 Tablespoon lime juice, 2 teaspoons sugar, and the cilantro (if using) in a small, heavy saucepan. Bring to a boil over medium heat, stirring well to mix, then reduce the heat to low and simmer, uncovered, until richly flavored, about 10 minutes. The sauce should be thick, but pourable; thin with coconut milk, if needed. Remove from the heat and taste for seasoning, adding fish sauce, lime juice, or sugar as necessary; the sauce should be highly seasoned. Serve warm or at room temperature. The sauce will keep, tightly covered, in the refrigerator for up to 3 days.